Pinfluencer, one of the many sites that have sprouted up to help companies track Pinterest usage, is today announcing a rebranding to Piqora, a move that the company says fits with its wider strategy to mine information not just from Pinterest and Facebook, but other image-based social networks like Tumblr, Polyvore and Twitter. To go along with its longer term social marketing ambitions, it is also spreading its product wings with the launch of Gallery, which lets brands, retailers and other businesses take products that get pinned elsewhere and aggregate and show them on their own sites. The two moves come as Pinterest slowly gears up to take more commercial control of its massive data stream of consumers pinning branded content, and brands and other businesses trying to use the wildly popular social network to push their products. The change to Piqora, says CEO Sharad Verma, was for a couple of reasons. First, lots of wordplay, eg, it brings to mind “pics”, short for pictures, as well as “pick”, reminiscent of the curating role that many play on sites like Pinterest, and IQ for analytics. That multi-platform strategy, he says, will see the company go beyond sourcing data from Pinterest and Facebook and extend to other social media sites organized around images. First up, he says, will be Tumblr, Twitter and Polyvore. Eventually, other social networks will also be added, Verma says. The reason for the aggregation of multiple social networks is because Piqora is also expanding its product set. Today sees the launch of a new Gallery mode that businesses can put on to their own sites, showing users what products of theirs are getting pinned on Pinterest (and tagged elsewhere) and giving users one more way of discovering them directly on those brands’ sites — and eventually buying them. This is all-important because it is one more sign of how companies are trying to “close the loop” between discovering a product, finding out more about it, maybe passing on the information to others, but most importantly — actually buying it. This follows on from developments announced in November, where Pinfluence announced integration with Google Analytics, CoreMetrics and Omniture, as well as ROI tracking on pins. It is also a mark of how, no matter how much marketing budget these companies are ploughing into sites like Pinterest and Facebook, they are still interested in spending more on their own turf — a trend highlighted by a recent survey from Gartner, which found that companies’ own websites still got the lion’s share of marketing budget above and beyond what companies were prepared to spend on other highly-trafficked sites. Gallery, Piqora says, will be optimized for tablets and effectively becomes the new public facing-product to sit next to the analytics that the company had already been providing to brands (customers include Overstock, Sephora, Zappos, Etsy, Z Gallerie, Orbitz, and Steve Madden). It charts not just what’s getting tagged and trending with consumers, but then also adds more retailer-specific data such as stock availability and purchasing links. This also puts Piqora more in direct competition with companies like Lyst, which also provides a similar level of detail about where to buy products. While Pinterest has yet to release an API, companies like Piqora have been picking up relevant data for its service by crawling publicly-available Pinterest pages. For now Pinterest is totally fine with this, it says, because many of these companies are providing services that Pinterest is not. As Pinterest’s product manager Cat Lee said to me at the time of its Analytics launch last week, the company is “super glad” that businesses like Piqora exist now. 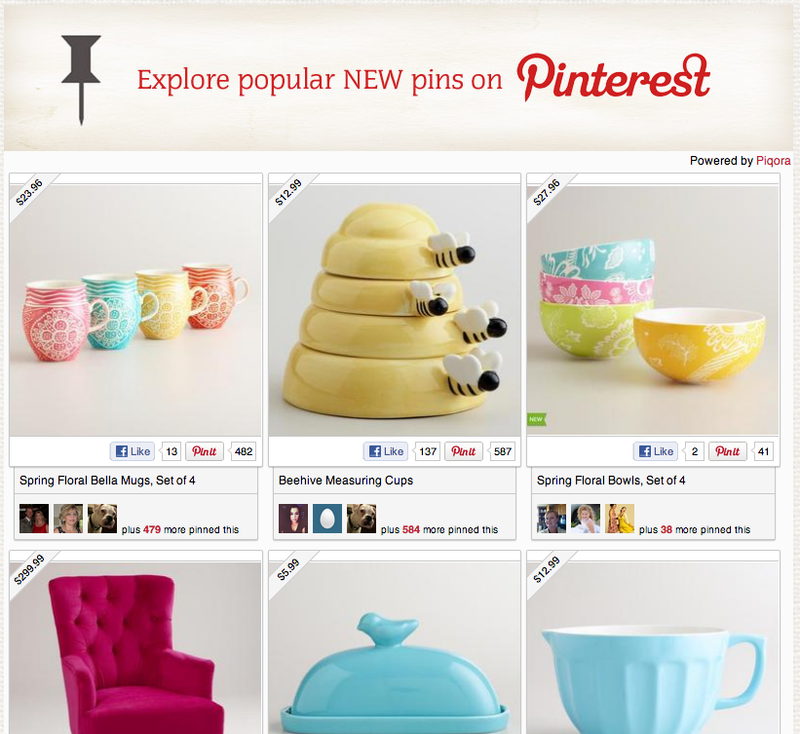 In part this is because they help brands keep the faith in using Pinterest as a platform now and in the future. “We hope that these businesses continue to provide services that we don’t have plans to add at this time,” Lee said. Two of the key examples she gave me: those who help businesses run contests and promotions and then measuring the level of engagement on these; and those helping companies manage email campaigns that feed into Pinterest traffic.